Our Media Manager, Kitty, is our go to person for all things arty and a little peculiar. 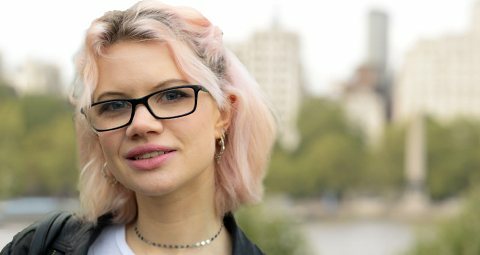 Kitty has been leapfrogging between roles in the creative industry for the best part of a decade; from playing rebellious teenagers in various BBC medical dramas to working as a painter in the art department On Wes Anderson’s latest film, Isle Of Dogs (a full list of Kitty’s credits and examples of her work can be seen on her website). Kitty has a degree from Ravensbourne College of Design and Communication in Digital Film Production where her tutors described her work as “peculiar and enchanting”. After taking an IQ test on a whim this February, Kitty is now a member of British Mensa with an IQ of 133. Kitty currently splits her time between selling vegan Vietnamese food with Eat Chay across several different London markets and working as our multi talented (and slightly whacky) Media Manager – all the while with her little dog, Nacho, by her side. During her time off, Kitty writes poetry, meditates, and occasionally takes on bizarre freelance projects like making a life-size robot out of toasters in the image of Gemma Chan for comedian, Richard Herring. So, in a nutshell, Kitty is just an all round ordinary and sensible young professional. Nothing to see here.